Kartini was born into an aristocratic Javanese family when Java was part of the Dutch colony of the Dutch East Indies. Kartini’s father, Sosroningrat, became Regency Chief of Jepara. Kartini’s father, was originally the district chief of Mayong. Her mother, Ngasirah was the daughter of Madirono and a teacher of religion in Teluwakur. She was his first wife but not the most important one. At this time, polygamy was a common practice among the nobility. She also wrote the Letters of a Javanese Princess. Colonial regulations required a Regency Chief to marry a member of the nobility. Since Ngasirah was not of sufficiently high nobility, her father married a second time to Woerjan (Moerjam), a direct descendant of the Raja of Madura. After this second marriage, Kartini’s father was elevated to Regency Chief of Jepara, replacing his second wife’s own father, Tjitrowikromo. Kartini was the fifth child and second eldest daughter in a family of eleven, including half siblings. She was born into a family with a strong intellectual tradition. Her grandfather, Pangeran Ario Tjondronegoro IV, became a Regency Chief at the age of 25 while Kartini’s older brother Sosrokartono was an accomplished linguist. Kartini’s family allowed her to attend school until she was 12 years old. Here, among other subjects, she learn to speak Dutch, an unusual accomplishment for Javanese women at the time. After she turned 12 she was ‘secluded’ at home, a common practice among Javanese nobility, to prepare young girls for their marriage. During seclusion girls were not allowed to leave their parents’ house until they were married, at which point authority over them was transferred to their husbands. Kartini’s father was more lenient than some during his daughter’s seclusion, giving her such privileges as embroidery lessons and occasional appearances in public for special events. During her seclusion, Kartini continued to educate herself on her own. Because she could speak Dutch, she acquired several Dutch pen friends. One of them, a girl by the name of Rosa Abendanon, became a close friend. Books, newspapers and European magazines fed Kartini’s interest in European feminist thinking, and fostered the desire to improve the conditions of indigenous Indonesian women, who at that time had a very low social status. Kartini’s reading included the Semarang newspaper De Locomotief, edited by Pieter Brooshooft, as well as leestrommel, a set of magazines circulated by bookshops to subscribers. She also read cultural and scientific magazines as well as the Dutch women’s magazine De Hollandsche Lelie, to which she began to send contributions which were published. Before she was 20 she hard read Max Havelaar and Love Letters by Multatuli. She also read De Stille Kracht (The Hidden Force) by Louis Couperus, the works of Frederik van Eeden, Augusta de Witt, the Romantic-Feminist author Goekoop de-Jong Van Eek and an anti-war novel by Berta von Suttner, Die Waffen Nieder! (Lay Down Your Arms!). All were in Dutch. Kartini’s concerns were not only in the area of the emancipation of women, but also other problems of her society. Kartini saw that the struggle for women to obtain their freedom, autonomy and legal equality was just part of a wider movement. Kartini’s parents arranged her marriage to Joyodiningrat, the Regency Chief of Rembang, who already had three wives. She was married on the 12 November 1903. This was against Kartini’s wishes, but she acquiesced to appease her ailing father. Her husband understood Kartini’s aims and allowed her to establish a school for women in the east porch of the Rembang Regency Office complex. Kartini’s only son was born on 13 September 1904. 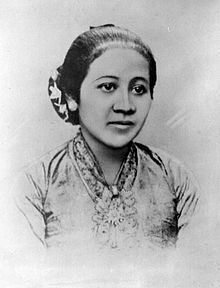 A few days later on 17 September 1904, Kartini died at the age of 25. She was buried in Bulu Village, Rembang. Inspired by R.A. Kartini’s example, the Van Deventer family established the R.A. Kartini Foundation which built schools for women, ‘Kartini’s Schools’ in Semarang in 1912, followed by other women’s schools in Surabaya, Yogyakarta, Malang, Madiun, Cirebon and other areas. In 1964, President Sukarno declared R.A. Kartini’s birth date, 21 April, as ‘Kartini Day’ – an Indonesian national holiday. This decision has been criticised. It has been proposed that Kartini’s Day should be celebrated in conjunction with Indonesian Mothers Day, on 22 December so that the choice of R.A. Kartini as a national heroine would not overshadow other women who, unlike R.A. Kartini, took up arms to oppose the colonisers. In contrast, those who recognise the significance of R.A. Kartini argue that not only was she a feminist who elevated the status of women in Indonesia, she was also a nationalist figure, with new ideas who struggled on behalf of her people, including her in the national struggle for independence. Do You Know Guys…Why spoken English is difficult to understand? ?